Citizens of Brazil who were born in Jerusalem will have their passports amended to eliminate “Israel” from the line denoting place of birth. Existing passports are to be reissued with the “offending” term deleted, and passports that are not changed will be invalid at the end of the year. While the rule change would appear to have been influenced by the U.S. Supreme Court decision earlier this year that Americans born in Jerusalem could not have their birthplace listed as Jerusalem, Israel – but rather would be listed as Jerusalem alone – Brazil had apparently made the decision on dropping Israel a year ago, according to the Brazilian embassy in Tel Aviv. Speaking to JTA, the officials said that the rule had been due to be implemented for some time, but was only publicized last week. In a statement quoted by JTA, Floriano Passero, a Brazilian-Jewish opposition lawmaker said that the ruling was “unfair” and would encourage “bias against Israel.” It was unrealistic, as well, he said. “Regardless of the path to peace between the two peoples, Jerusalem certainly will remain an inseparable part of Israel and a citizen born in Jerusalem has every right to display their country of birth: Israel,” he wrote in a statement. 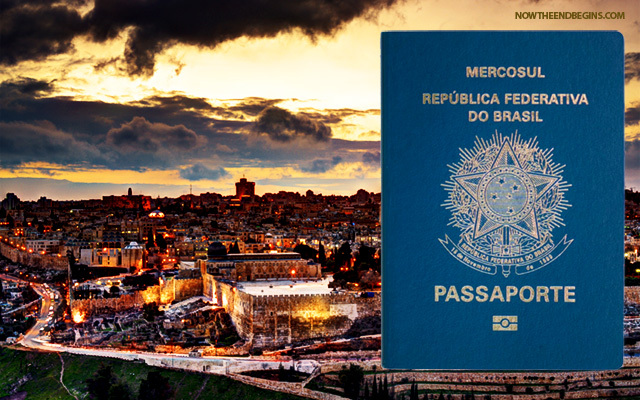 The change is expected to affect 60 people out of 15,000 Israelis who hold Brazilian citizenship. In June, the Federal University of Santa Maria in the State of Rio Grande do Sul in Brazil came under pressure after the dean requested a list of Israeli students and lecturers due to pressure from various organizations. Jose Fernando Schlosser justified the move by stating that the list was requested by the teacher’s union, the student association, and The Association of Solidarity with the Palestinian People. Just last week, former Yesha Council chairman Dani Dayan was appointed as Israel’s ambassador to Brazil.